For years, in our little family of three, we have written each other love letters, folded them like paper airplanes, origami or rolled them like scrolls and stuck them in the Christmas tree. It's one of our traditions. Part of decorating the tree each year includes reading through the past love letters, and being reminded of how we have loved each other well...and not so well. Our son's letters, from when he could write, are filled with the innocent, bold love and the wild hope of a child. Some of the letters Scott and I had written were painful to read, so there are some we burned, putting them forever in our past. The letters Scott and I wrote to each other reveal that longing for something more, something we didn't know we needed. We could feel each other slipping away. 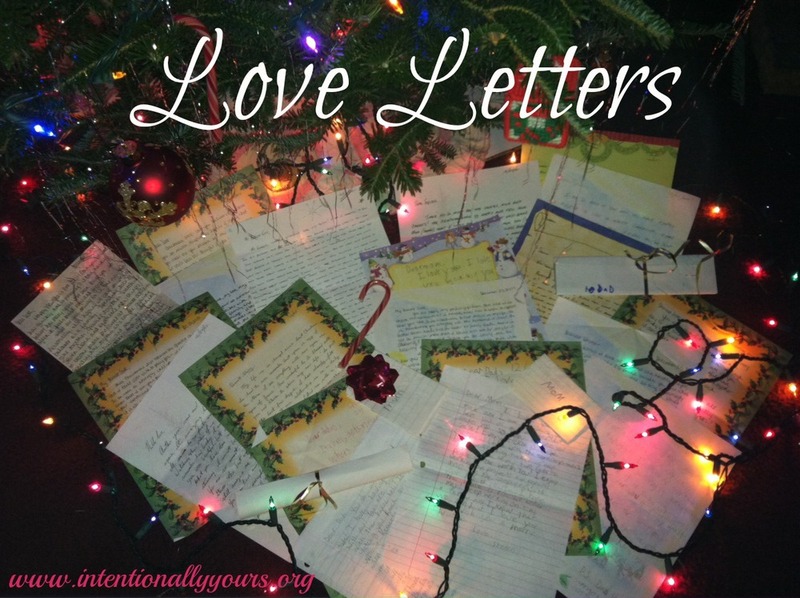 The conflict we shared and the things that got under our skin about each other seemed so much bigger than any hope either of us felt, and it was reflected in our "love" letters. We didn't know how to love each other until we accepted God's love for us. And when we did, how our letters changed! What a difference four years and submitting to Jesus Christ makes! Our letters to each other are different, our letters to and from our son are different. I've heard different pastors call the bible God's love letter to us. Wow, how reading that love letter changes us! I wouldn't trade any part of our journey for anything, for ever step we've taken and every word we've spoken has brought us to this place in our lives. And we don't stand still here; we keep walking with Jesus through the tough stuff of life, keep loving each other and keep loving Jesus more. And we keep writing our love letters. Merry Christmas, everyone!! Love each other well! When was the last time you wrote each other love letters? Pray, asking God to reveal to you the way you love, pick up a pen and piece of paper and tell your spouse and children how much you love them! Military minded? Check out these related posts on Excellent or Praiseworthy: Love Letters, Her Favorite Christmas Present and Lonely Christmas. Looking for a great Christmas gift? Book a Weekend to Remember for you and your spouse, or for a couple in your sphere of influence. This weekend changed our lives, marriage, and legacy forever. Click here to find a getaway near you!